It’s that time of the year! Schools are out, and families are planning summer vacations. Whether the travel is by a car, a train, a ship or a plane…what to wear? For me, comfort & convenience are the most important factors. Since we’ll be going on a long trip by plane this summer, I wanted to share what I will be wearing on the plane. With this very comfortable & stretchy maxi dress, I’ll add a jacket or a sweater…I get cold on the plane. I also prefer a crossbody bag (vs a shoulder bag) to store travel documents for safety, and it allows me to handle a carry on bag and whatever else I need (usually food) without worrying about keeping the bag on my shoulder. I usually have a large scarf for times when the jacket/sweater might be a bit much. Of course, a very comfortable pair of sandals is a must, and I usually pack a pair of socks that I can put on during the flight. If the flight is longer than a few hours, I also pack my small travel pillow and my Kindle to catch up on some reading! What are some of your favorite travel outfits? I hope your weekend was a restful one, and I thank you for stopping by. use it for a blanket! I think a lot of ladies opt for leggings and a tunic. I just found maxi to be more to my taste. Oh, I agree about the gum, it’s a must! Comfy while flying? Harem pants. Honest! Love your white denim jacket! Like you I like wearing a dress or skirt on flights and always keep a big scarf handy. It gets chilly on airplanes. Yes, a big scarf and socks!! Beautiful as always! I love black and white. And the scarf is gorgeous! You can mix it all up so much! Socks, pillow, Kindle & iPod!! hmm. Love the maxi but I always get patted down when wearing a dress through security. Always! You do? I wonder why? I’ve been very fortunate so far…knock on wood! I think so….learned from past mistakes. Glad to catch up with you before you go! I’ve been on the run myself. I love a maxi when traveling and yours looks great. I also love a cross body bag for hands-free traveling. Since I can’t bear to give up my jewelry, but I hate having to strip everything off at security, I often wear my african woven bracelets and beaded earrings. Have a wonderful, relaxing time!! Hope to see you when you return. It is a busy time of the year for everyone. I hear you about the jewelry. I go pretty minimal on that dept when I travel. A large colorful scarf is such a great idea! I can see it used as a shawl as well. Even a sarong skirt maybe? I always have packing anxiety and then end up hating my clothes that I brought and want to come home and re-do my whole wardrobe! I think part of my problem is that I don’t bring my nice things. So I end up feeling sort of frumpy. You’ve given me some good ideas here. Next time, no jeans for me! This blogging stuff is giving me a new appreciation for dresses and skirts. Oh, I doubt you look anywhere close to frumpy. You have a distinct style of your own, and I think it’s most excellent! Your fun personality reflects your style, and I find it so refreshing! You rock, Joni! Glad I could inspire, as you have inspired me to clean out my closet! Jeannie, like you, I have to have a good-sized scarf, so easy to take on or off with unpredictable temps. I usually wear skinny jeans, but love the idea of wearing a comfortable maxi dress or skirt. You manage to make comfy look like a runway show, tho’! Aww, you are too kind, Lynne. Try the maxi next time, you’ll never go back to jeans! Gorgeous…I love this scarf…it is the perfect topper to the look! have a great week! Gorgeous Jeannie! That is what I normally wear on flight also (or a pair of harem pants but the DH hates it)! That last picture of you is amazing – such a cool effect! I wore the EXACT same thing on my flight to Asia! Maxi dress with a jean jacket and a scarf! I love the color of your scarf! Where did you go in Asia? We visited S. Korea a few years ago….loved it, but such a long flight!!! Me, too! For a long trip, I have a great set of travel blanket & pillow from Brookstone that I often take with me. Gorgeous outfit! When I’m allowed to buy again I might get me a maxi and try out your look. Really pretty scarf too! Love the outfit!!! The scarf is stunning on you!! Have fun in Hawaii!! Take the jacket off and vavavavoom. I love wearing dresses on plane rides. To some it sounds funny but a nice flowy dress is the most comfortable to me. 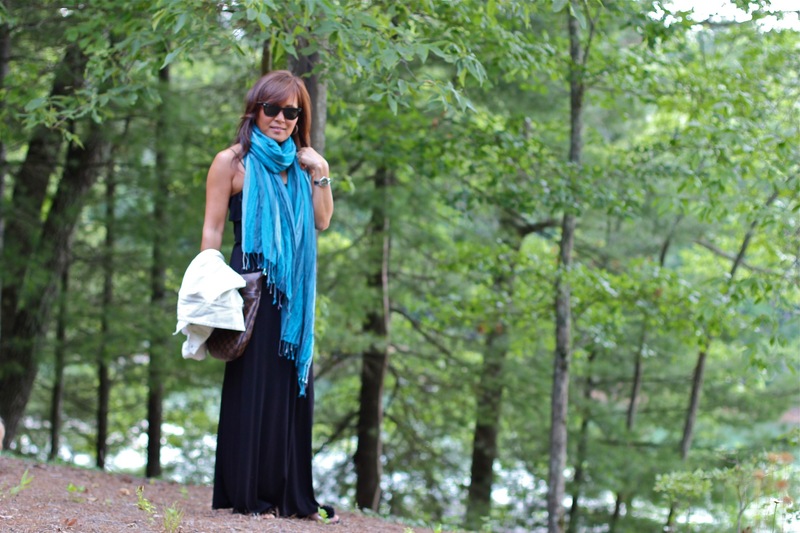 A maxi and a scarf is totally my go to travel look! Yours is lovely! They’re so easy to wear, aren’t they? Yes, a maxi-dress is perfect for air travel – and I love the cross-body purse, great idea. You look gorgeous, as ever. Thanks for linking up to Visible Monday! It would come in handy strolling down the streets of NYC, too! Have a wonderful day in the city! you look far more fashionable on an airplane than i ever could! i’m fond of yoga pants with a long knit top. extra sweater or wrap for the inevitable ‘freeze’. slip on sandals, with socks in my carry on. most essential, though, are the earplugs and/or noise canceling headphones. not fashionable, but man, have they saved my life on many occasions! Haha..absolutely the headphones! I love listening to Jimmy Buffet or some Reggae to chill out. Yoga pants sounds like a winner. I’m loving your blog ! You have great style and, it has inspired me to try new looks. Thanks so very much, I’ve had problems with choosing a new style at 50…ish. Thank you so much! It is difficult at our age to dress fashionably yet age appropriately…a balancing act at times. I’m so glad you stopped by! I love your travel friendly dress, so light and comfortable and doesn’t take up too much space too! The scarf is a simple yet chic accessory. And…I am so admiring your tan and toned shoulders….time for some sun and work out for me this summer! About tanning….I do use SPF30 sunscreen, tho I do tan easily. Sooo bad for my wrinkles! I love this short white denim jacket ! it’s perfect with a long skirt ! What a beautiful combination of blue with black. The scarf is gorgeous, I love it. And the dress looks very comfortable. You are gorgeous and very youthful. Thank you Josep! Very sweet! The dress IS super comfortable. I too have a long flight coming up and I always wear trousers on the plane. That’s because I can’t manage to sit straight with both feet on the ground for more than 1 minute. I wiggle, rest my knees against the chair in front of me and if I get lucky to get 2 chairs, will rest them there. I also get very cold, so I’m always prepared with at least a cardigan and an extra scarf. Comfort always comes before styling when flying although I try to combine the 2. Your outfit certainly does that. Very stylish! 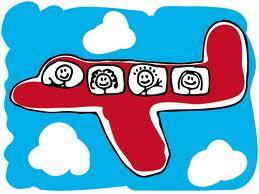 Where are you heading to this summer? I, too, am very restless on the plane. This dress is made of stretchy fabric, so it allows me to do whatever I need to do with my legs without looking too ridiculous. Lovely! Although I was secretly hoping that you would go to Europe so we could bump into eachother! We actually thought about doing a European cruise, but heard it was going to be too hot. It would have been fun to meet up! I suppose when you travel a lot, you learn what works best for you. It’s such a pain to go thru security these days….although necessary, I suppose. I like it. Looks both chic and comfortable. I, too, always use a cross-body bag for traveling–it is a must! I agree, a crossbody bag is a must if you’re forgetful like moi. I’m horrible about leaving things behind…this one stays on my body. Comfortable, yet elegant! 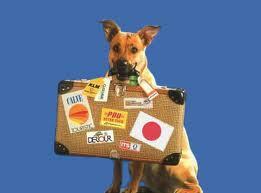 A great look for travel….when are we leaving? We are leaving in about three weeks! Are you ready? Pretty outfit and perfect for traveling in, I love scarves! Great tips. Thank you! I love scarves, too! How exciting! Your outfit sounds perfect! I hope you have a wonderful trip to Paris! What a way to celebrate your anniversary! 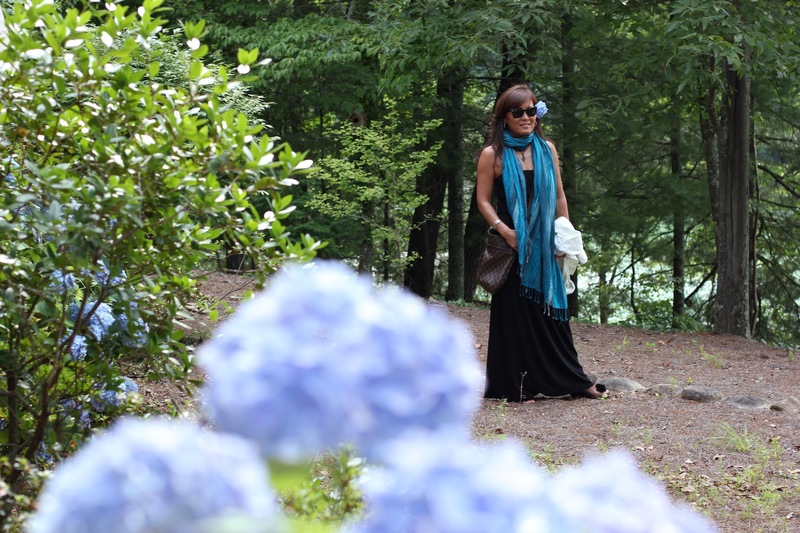 I love the maxi with the the scarf and the pic with the hyacinth in your hair is just beautiful. I find maxi (made of stretchy fabric) to be far more comfy for long trips… also, no belt to worry about going thru security. This bag does come in very handy for traveling & shopping. Great tip about a cross body bag. Haha! Yoga pants would be comfy! Have a good day Amy!